Walking is not that simple. It takes practice. Walking like the world... that looks easy. always trying to choke back guilt. Walking like a nominal Christian... that is not so easy. standards most of the times trying to suffocate the Truth. 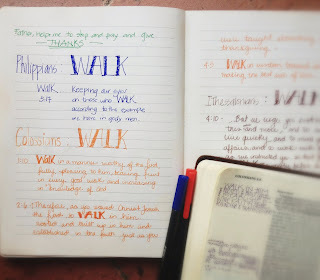 Walking like a Christian... that is not easy. and proclaim Truth, never drown it. I think of my children when they were little, and how their brains and legs knew how to walk. I loved to be there to hold their hands, and push them a little bit, and hug them happily whenever they took a step. I was there too when they were insecure and fell, and cried, and were afraid to take a new step. And this is how our Christian life is. We, Christians, are born of the Spirit. We can walk in Truth, our new nature is built for that, but it is also true that we need help and encouragement, someone to hold our hand and teach us. Someone who will hold us tight when we want to avoid the Truth. Someone who will pray with us whenever we are afraid to take another step. Our Father in his goodness provides us with relationships that help us walk this Christian life; but more importantly, He has given us His Word and the Holy Spirit to teach us and encourage us to walk in the Faith. Today is Saturday and maybe it is a good time to do this; read the epistles in one sitting, just like your favorite book, that one that is hard to put down, and find your delight in abiding in the Word. I will be digging in the rest of the epistles this weekend to search more about how this walking in the Lord should look like. We must be ready, this walk is not always easy, let us hold tight to the Father's hand and depend on Him.